A fascinating article, Jane. Thank you. As to the sign … perhaps it hangs from a shop run by the ‘Brussel’ family, then all could be explained and forgiven, for that would make sense in any of the three languages. Oui? Or perhaps the owner is a grocer at heart. 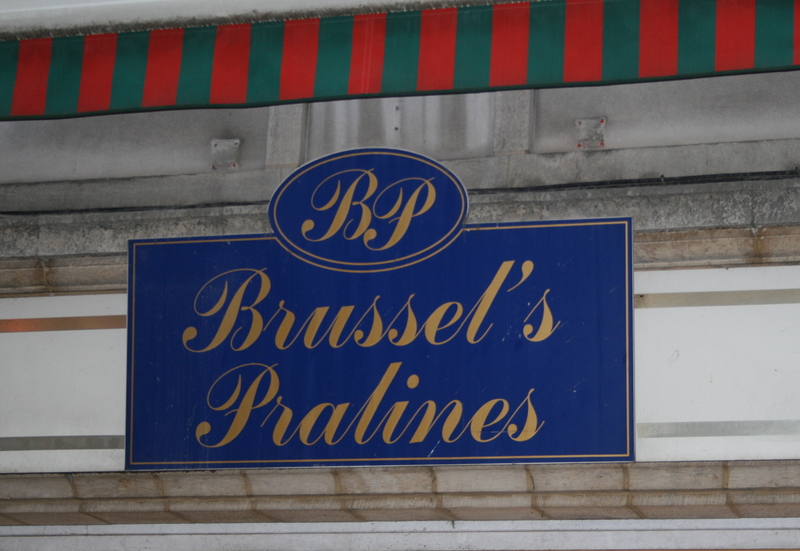 If it were run by the Brussel family then it would be run by the Brussels so that would make it “Brussels’ Pralines” but Brussel’s Pralines would do if it were run by just Mr or Ms Brussel alone. Let’s face it however we’re all being a bit too charitable; the shopkeeper is just guilty of trying too hard and got it wrong. If in doubt, stick in an apostrophe. Anywhere. Just as they do in the UK. Since “Brussel” is the Dutch-language equivalent of “Brussels”, and “pralines” for luxury chocolates, this might very well be Dutch. The apostrophe-s for the possessive is contested in that language, but in proper names it does occur fairly regularly. Thank you Bessel! I had no idea that Dutch used the possessive apostrophe. I am sorry that I maligned the writer of that sign. I get so used to misplaced apostrophes in England that it just looked to me like a grocer writing Brussel’s sprouts (which I have seen). To be fair, Freshword, many Dutch language authors would disapprove of the apostrophe-s here, too. And yes, it is not surprising that you have seen “Brussel’s sprouts”. One general conclusion might be that in such cognate languages as English and Dutch, the distinction between apostrophe-s and solid -s is difficult for many people, not only, of course, greengrocers. Unfortunately, the problem doesn’t end or even begin there. A number of educated francophone Belgians even have a hard time with their own language. Best/worst example: “je l’ai besoin”/”tout ce que j’ai besoin. I just have to sit there and bite my tongue (or lose many of my friends). Thank you for your comments, and now I now who you are! Alan enjoyed meeting you at the weekend and had reported to me on your comments about misuse of ‘besoin’. I bite my tongue when I hear ‘I feel like I’ve run a marathon’. But my tongue is getting so sore I am going to have to stop. Thanks Jane, I could tell from Alan’s incredulous expression on Saturday night that my news of the abuse of “besoin de” would filter back to you pretty quickly ! As for the misuse of the subjective, or rather its absence, even after “dommage que”, don’t get me started. I’ve done it again (typing faster than I can think). For “subjective” please read “subjunctive”. Obviously. Literally. Actually. Regarding hispanic FM radio stations I suggest you first choose your preferred accent and usage (vos in Argentina perhaps, or maybe not ? ), then choose the capital city of the corresponding country and google FM radio accordingly. Flemish? In Flanders people speak dutch. Like in Austria people speak german instead of austrian. I’m sure that many educated, professional, people will have diverging, sometimes partisan, opinions on this subject but in my experience “Dutch” (ABN=Algemeen Beschaafd Nederlands= General Civilized Dutch) is taught in Belgian schools while Flemish is spoken in many Belgian homes (and school playgrounds). ABN is the politically correct version while Flemish, of which there are several dialects, not all mutually understandable, is what is spoken. By the way, a surprising number of my educated (francophone) Belgian friends insist that the language spoken in the USA is American. I put a stop to that by pointing out to them that we are having that conversation in French not Belgian. Nevertheless I see many a “French” book “traduit de l’américain” or “australien” or “sudafricain” depending on the nationality of the author. I must check out what they say for Salman Rushdie’s works. When I was in Brussels, I told a local that I could not hear the difference between Dutch and Flemish. He spent the next ten minutes pointing out the differences. I accept that they were mainly to do with local usage and dialect of the Dutch language – but does that not nonetheless make it legitimate to refer to speakers of Flemish? Glaswegians read and write English. Most of them can speak English that is comprehensible to foreigners from England when they want to, but they can also speak Glaswegian that is not! It doesn’t take long listening to both versions to notice the difference and distinguish one from the other. The local trick is simply to zap from Flemish TV to Dutch TV, for example at news time, and the difference becomes apparent, probably even to a total non-Dutch/Flemish speaker. Afrikaans is another matter. I’ve seen Afrikaners on Dutch TV complete with subtitles…in Dutch.